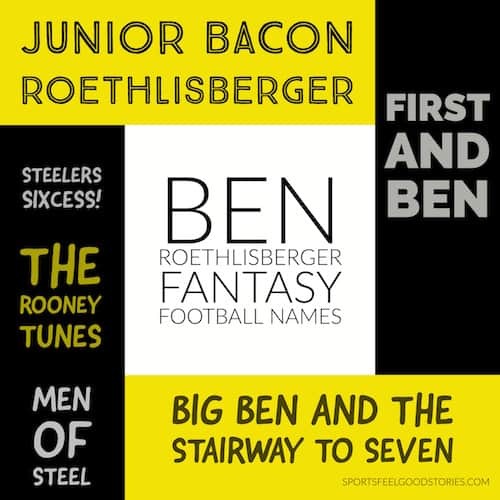 This collection of Ben Roethlisberger Fantasy Football names will give you lots of options if you land the Pittsburgh Steelers quarterback on your team. Even Big Ben Is Right Twice A Day. Ben and the Art of Passing Maintenance. All Things to All Ben. 99 problems but Ben ain’t one. That Was Ben; This is Now. Big Ben and The Stairway to Seven. A graduate of the Miami University in Ohio, Roethlisberger grew up in Ohio. He was captain of his football, basketball and baseball teams in high school. Roethlisberger has won two Super Bowls with the Pittsburgh Steelers and appeared in three. He was the youngest QB to win a Super Bowl at the age of 23 years old when he led his team to a 21 – 10 win over the Seattle Seahawks in Super Bowl XL. Big Ben also has the record for most wins in his rookie season as a QB with 13. Check out the Steelers on Twitter. Q-1. What’s unique about Big Ben on Madden Football? A. Because of the length of his last name, it’s shortened to Roethlisbergr on his jersey in the video game. Q-2. What position to Big Ben play for his high school basketball team? You’re on Ben Roethlisberger Fantasy Football Team Names.